On 22 January, Trafford Council published the results of the Stretford public realm consultation, on their website. Here, you can find a presentation, summary of the results and the full report, containing the responses. 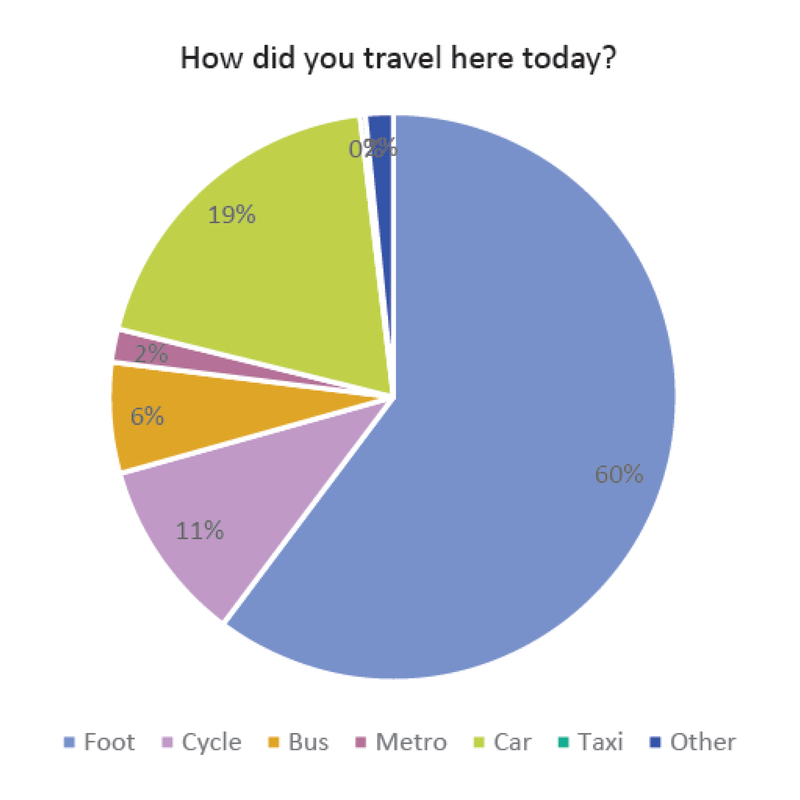 Within the results, you’ll find the following chart, detailing the responses to the question How did you travel here today? How did you travel here today? So, what does this tell us? It tells us that out of those consulted, 81% didn’t use a car to travel to Stretford town centre. 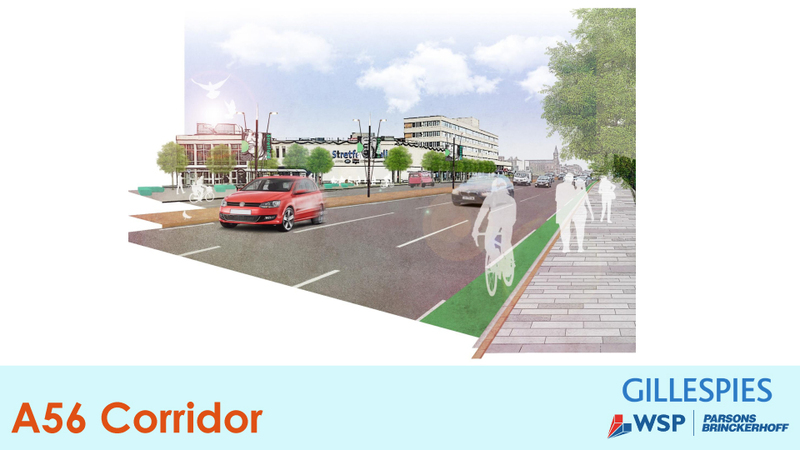 So these proposals are all be about making it easier for people not driving to get about Stretford, right? Wrong. They’re come across as being all about smoothing traffic flow through Stretford, and particularly to Chorlton. As shown in the original proposals, we see the removal of all but one subway, with at grade crossings replacing them. At grade crossings are a welcome addition, particularly at night, but it’s at the expense of the subways and the convenience they bring. This is a significant loss, particularly when you examine the proposals and see the number of stages involved in the new crossings. 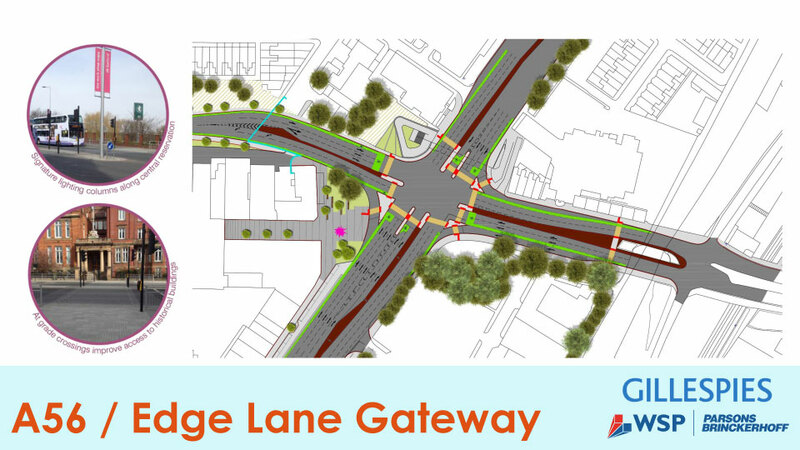 Going from the north side of Edge Lane to the south side of Kingsway will require going across seven stages. Not good, when a number of these is across a 40mph road with eight lanes. In the original proposals, reducing the speed limit to 30mph is merely an ambition, in the presentation, there’s no mention of a speed limit reduction. On the M32 Facebook group, I asked Cllr Stephen Adshead about the reduction in speed limit. Although he said “were [sic] been pushing for this for years and have the support of senior officers, i am clear it will happen”, he wasn’t able to say it’s 100% definitely happening. The concern here, is even with a reduction in the speed limit, the A56 is still essentially an urban motorway, varying between six and eight lanes. This encourages drivers to speed way above 30mph, just by the design of the road. The additional right turn lane to Chorlton is about improving traffic flow. Anyone who travels through here at busy periods will know that the current single right turn lane often backs up to the gyratory at Stretford House. Introducing two lanes here will probably provide a temporary improvement to traffic flow, but for how long? Also, given that right turn traffic often overflows at Edge Lane already, blocking the southbound A56 traffic, having two right turn lanes will make this even worse. The plans and visualisation of the A56 corridor still include woefully inadequate cycling provision, considering this is the main route from South Trafford to Manchester. Unfortunately, there seems to be a view that because the Bridgewater Way is close by, there’s no need to provide cycling provision along the A56, particularly as it would take space away from the previous vehicle lanes. But as anyone who’s used the Bridgewater Way will know, it shouldn’t be seen as anything but a leisure route as it’s not fit for purpose for anything more. It can be very busy, putting off inexperienced riders and dark and unwelcoming at night. It also isn’t particularly suitable for local use, given it’s away from the main routes and shops. At a minimum, there should be continuous, fully segregated cycleways with bus stop bypasses, matching the standards of what’s being introduced on the Wilmslow Road Cycleway. 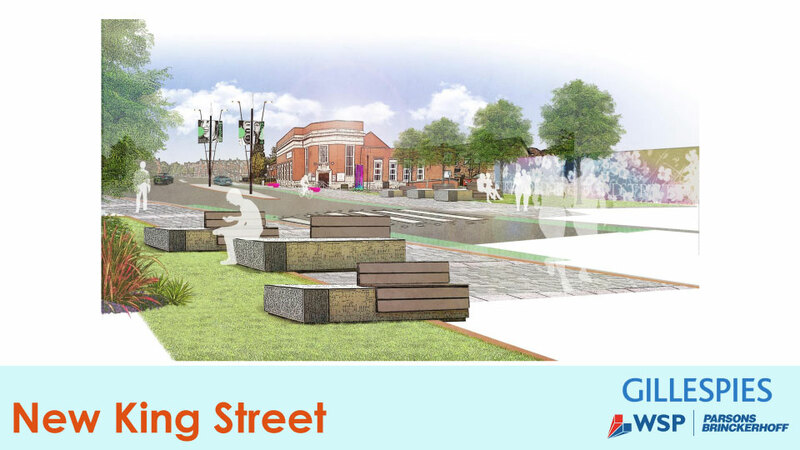 The proposals for New King Street (Kingsway) still include Poynton style Placefaking. I covered this in detail in my previous post, but as I’ve said there, I think this treatment is wholly inappropriate for the level of traffic and the 30mph speed limit (no reduction to 20mph as originally mentioned). Again, the plans and visualisation include very poor cycle provision, given this is a key route for those cycling from Urmton and Stretford to Manchester, Chorlton and beyond. 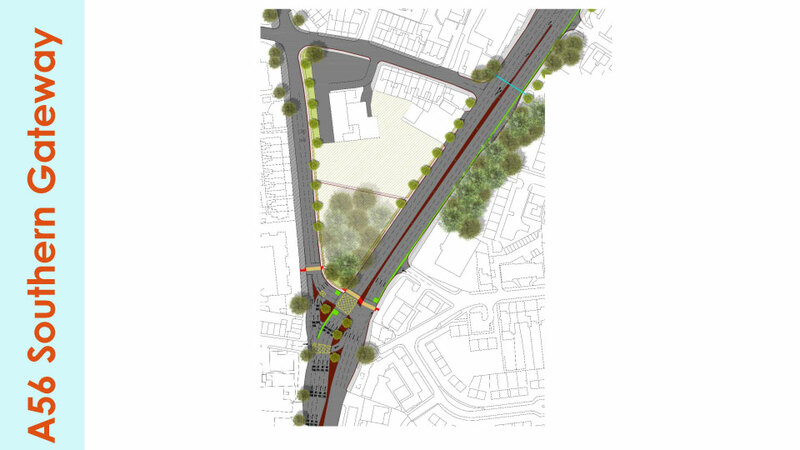 Removal of the gyratory is welcomed by many, given how dangerous the current layout is for cars and bikes. But again, there’s a complete lack of decent cycle infrastructure on what is a key route to Urmston and Trafford Park. In addition, it doesn’t address the congestion issues on Barton Road, which carries far more traffic than was intended and often resembles a car park. Although many of the issues I raised were also raised by others in the consultation and acknowledged in the results. There doesn’t appear to be any changes made to address them or any other issues. This makes the whole consultation appear to be little more than a box ticking exercise. Disappointing, but not entirely surprising. The improvements proposed here do little to address the fundamental issues affecting Stretford. The level of traffic, pollution and the way the town is divided in two by an urban motorway. What it amounts to is cosmetic changes and measures to improve traffic flow. Inevitably, this will just lead to more traffic problems due to induced demand. According to the website, Trafford Council will now progress the procurement and delivery of the detailed design work. So it looks like there’s little that can be done to stop it going ahead. Though I sincerely hope we at least see improvements during the detailed design phase and that Trafford Council actively engage with members of Trafford Cycle Forum to improve the cycle infrastructure.